Read Frontmatter [PDF], Excerpt [PDF]. 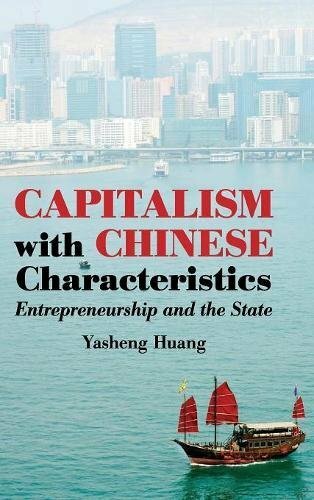 This book presents a story of two Chinas – an entrepreneurial rural China and a state-controlled urban China. In the 1980s, rural China gained the upper hand, and the result was rapid as well as broad-based growth. In the 1990s, urban China triumphed. In the 1990s, the Chinese state reversed many of its productive rural experiments, with long-lasting damage to the economy and society. A weak financial sector, income disparity, rising illiteracy, productivity slowdowns, and reduced personal income growth are the product of the capitalism with Chinese characteristics of the 1990s and beyond. While GDP grew quickly in both decades, the welfare implications of growth differed substantially. The book uses the emerging Indian miracle to debunk the widespread notion that democracy is automatically anti-growth. The single biggest obstacle to sustainable growth and financial stability in China today is its poor political governance. As the country marks its 30th anniversary of reforms in 2008, China faces some of its toughest economic challenges and substantial vulnerabilities that require fundamental institutional reforms. Yasheng Huang teaches international management at Sloan School of Management, Massachusetts Institute of Technology. His previous appointments include serving as assistant professor at the University of Michigan, associate professor at Harvard Business School, and consultant to the World Bank. In addition to journal articles, Professor Huang has published Inflation and Investment Controls in China (Cambridge University Press, 1996), FDI in China (1998), and Selling China (Cambridge University Press, 2003). Selling China examined the institutional drivers of foreign direct investment (FDI) in China and was profiled in numerous publications, including the Wall Street Journal, Economist, Businessworld, Le Monde, Economic Times, and Liangwang (Outlook in China). His research on FDI was cited in a number of major government reports on FDI policies and regulations. In collaborative projects with other scholars, Professor Huang is conducting research on engineering education and human capital formation in China and India and on entrepreneurship. Professor Huang is the recipient of the Social Science-MacArthur Foundation Fellowship and the National Fellowship. MOST people, particularly those living outside China, assume that the country’s phenomenal growth and increasing global heft are based on a steady, if not always smooth, transition to capitalism. Thirty years of reforms have freed the economy and it can be only a matter of time until the politics follows. This gradualist view is wrong, according to an important new book by Yasheng Huang, a professor at Massachusetts Institute of Technology. Original research on China is rare, largely because statistics, though plentiful, are notoriously unreliable. Mr Huang has gone far beyond the superficial data on gross domestic product (GDP) and foreign direct investment that satisfy most researchers. Instead, he has unearthed thousands of long-forgotten pages of memoranda and policy documents issued by bank chairmen, businessmen and state officials. In the process he has discovered two Chinas: one, from not so long ago, vibrant, entrepreneurial and rural; the other, today’s China, urban and controlled by the state. In the 1980s rural China was in the ascendancy. Peasants, far from being tied to the land, as has been assumed, were free to set up manufacturing, distribution and service businesses and these were allowed to retain profits, pay dividends, issue share capital and even a form of stock option. State banks rushed to provide the finance. Nian Guangjiu, a farmer from impoverished Anhui province, built up a business selling sunflower seeds (a popular snack), employed over 100 people and made a million yuan (nearly $300,000) in profit in 1986—just a decade after Mao’s death. Because most of this activity was set up under the misleading label of “Township and Village Enterprises”, Western academics largely failed to spot that these ostensibly collective businesses were, in fact, private. But then, in 1989, came the Tiananmen Square protests. A generation of policymakers who had grown up in the countryside, led by Zhao Ziyang, were swept away by city boys, notably the president, Jiang Zemin, and Zhu Rongji, his premier. Both men hailed from Shanghai and it was the “Shanghai model” that dominated the 1990s: rapid urban development that favoured massive state-owned enterprises and big foreign multinational companies. The countryside suffered. Indigenous entrepreneurs were starved of funds and strangled with red tape. Like many small, private businessmen, Mr Nian was arrested and his firm shut down. True, China’s cities sprouted gleaming skyscrapers, foreign investment exploded and GDP continued to grow. But it was at a huge cost. As the state reversed course, taxing the countryside to finance urban development, growth in average household income and poverty eradication slowed while income differences and social tensions widened. Rural schools and hospitals were closed, with the result that between 2000 and 2005 the number of illiterate adults increased by 30m. According to Mr Huang, the worst weaknesses of China’s state-led capitalism—a reliance on creaking state companies rather than more efficient private ones, a weak financial sector, pollution and rampant corruption—are increasingly distorting the economy. But what about the growing cohort of Chinese companies starting to strut the world stage? Surely that is evidence of a healthy and expanding private economy. Mr Huang’s evidence shows that, on closer inspection, these firms are either not really Chinese or not really private. Lenovo, a computer group, has succeeded because it was controlled, financed and run not from mainland China but from Hong Kong (a happy legacy of the founder’s family connections there—not something enjoyed by most Chinese businessmen). The subsidiaries of Haier, a white-goods maker, were also put out of reach of mainland bureaucrats early on. Wahaha, a food producer, Galanz, a maker of microwave ovens, and many others all depended on foreign protection and capital to grow and escape state strictures. Indeed one of the main, and underappreciated, functions of foreign investment in China has been to play venture capitalist to domestic entrepreneurs. As for Huawei, a telecoms group and one of China’s much vaunted “global” companies, its structure and links to the state are so convoluted that the most diligent China-watchers have little idea if it is a private or state firm. They do, however, agree that Huawei’s opacity is a microcosm of China’s distorted economy. Could China genuinely embrace entrepreneurial capitalism again, as it did in the 1980s? Its current leaders under President Hu Jintao, who cut his teeth in Guizhou and Tibet, two of the poorest and most rural provinces, talk about supporting the countryside and reducing social inequality. But nothing much has been done. China’s deep problems demand institutional and political reform. Sadly, as Beijing’s heavy-handed control of the Olympics suggests, there is scant hope of that. From The Economist, Oct 2nd 2008.